With so many games this year disappointing fans all across the board, Middle-Earth: Shadow of Mordor started off as a game that most people labeled as an “Assassins Creed Clone” and ignored it. But then we are introduced to the nemesis system and everyone changed their minds and started to pay attention. This made Middle-Earth: Shadow of Mordor one of the most anticipated games to come out, and unlike most of the games to come out this year this game is not a disappointment it may be a strong contender for game of the year. You play as Talion who is possessed by a wraith (if you don’t want spoilers on who the wraith is don’t worry I will only be referring to him as the wraith). Talion is a ranger of Gondor stationed on the Black Gate during the time of Saurons return to Mordor. It is set 60 years before the Lord of The Rings so don’t expect to see Frodo or Aragorn. You do see some cameos which I won’t spoil. When Sauron returns with his army Talion and his family as well as everyone else stationed on the black gate. Then suddenly you wake up and find out you are bound to a mysterious wraith and the only way to break the curse is to find the one who cast it on you. Than simply put “one does simply walk into Mordor” and the game throws you into the open world right away. When you play Middle-Earth: Shadow of Mordor you will make comparisons to games like Assassins Creed and the Batman Arkham games. 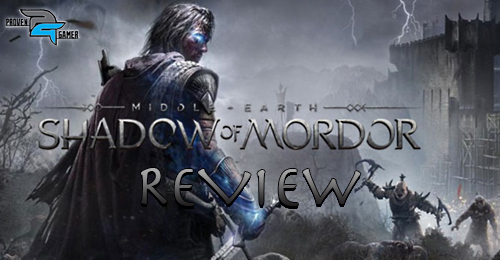 However even with the similarities Middle-Earth: Shadow Of Mordor is an original game with great game play that mixes together stealth combat and ranged combat seamlessly. The stealth works great as you can switch between the regular world and the wraith world, the wraith world works as a version of detective mode so you can see enemies thru walls. All of these features work well and feel very rewarding as you switch between these 3 combat styles seamlessly and mow down every and any orc in your path. While the game play is amazing and fun you need to have a good story to compliment the game play. The story in the game does start off simple and seems very generic but as your progress through the game and learn more about the wraith and Talion and how they mesh, that is when the story gets interesting and you do become invested and care about these character’s. You can find artifacts which act as lore and aren’t just boring text boxes they are fully voice acted, which brings me to my next point. The voice acting in this game is superb, Troy Baker of course delivers a solid performance and brings Talion to life. Alistar Duncan also does a solid job as the Wraith and they both work well together and make the game even better. Now on the to the biggest and coolest part of the game and the system that caught everyone’s attention, the nemesis system. The nemesis system is probably the coolest and most innovative new feature I’ve seen in a game in a very long time. The nemesis system lets you create your own nemesis as when you start the game you are given a random selection of orc captains and warchiefs that are completely random and unique to your own game. If you encounter a captain and throw him into a fire believing he burned to death he has a chance to come back, and if he does he will have a unique piece of dialogue that shows he remembers that you burned him and left him for dead, he will also have burn marks on his body or arm. Also if a captain kills you, and you encounter him again, he will remember you and gloat that he killed the grave walker! This makes each encounter feel more immersive and real. Since you will make your own enemies and hold grudges chances are you will spend a lot of time killing, fighting, tracking these captains and end up playing 20 hours before you’ve past the first area. This system makes your experience with the game drastically different from your friends experience, trust me after playing this game you will have countless stories about that one captain that kept killing you or kept escaping or wouldn’t die. This system alone makes the game worth playing. The music and graphics in this game are also amazing ,each area you visit looks breathtaking and the character models look just as detailed. As soon as you hear the music in this game you will recognize that you are playing a Lord Of the Rings game which is a definite plus. The music switches between epic battle music to soft background music when you are exploring and it blends beautifully and really makes you immersed in this world. Middle-Earth: Shadow of Mordor blends together amazing game play with an engaging story which includes one of the best features to be featured in a game in recent years. It is more than worth buying at full price and I guarantee you will not be disappointed by this masterpiece of a game. Im an 18 year old college student who has a passion for gaming. My first gaming console was the PlayStation 1. I've done beta testing for Ubisoft and Sony. Is that good or do I need more for my biographical info?